Jamaica’s best female reggae singer and the most positive Rastafari in the world on one stage, that’s a guarantee for one big dose of happiness. Queen Ifrica and Tony Rebel have been part of the reggae world for decennia and since 1998 they have been turning concert halls and festivals upside down with their catchy vibes. Queen Ifrica (Ventrice Morgan) is the daughter of ska legend Derrick Morgan and combines social criticism with good reggae beats. No matter how personal and compelling her lyrics might be, the Jamaican will always make her audience dance. Tony Rebel (the artist name of Patrick George Anthony Barrett) has been in the music business since 1990 and is known for his positive but especially humoristic approach to the world and to life. His tight style of singjay-ing gives power to the songs, and more than confirm his musicality. 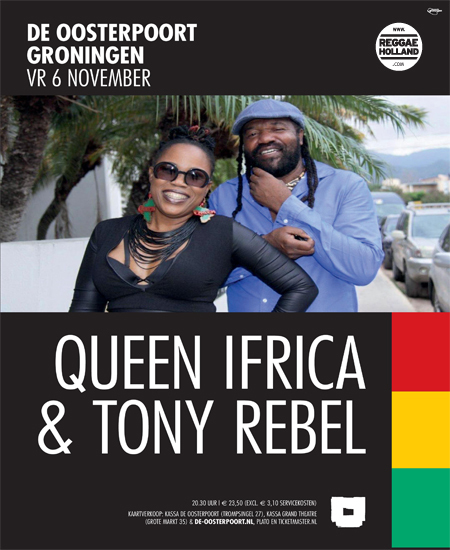 Together Friday November 6th Queen Ifrica and Tony Rebel will turn De Oosterpoort into a real reggae paradise.